What are the best sports lenses? There are a huge number of outdoor sports. Watching the summer and winter Olympics bring this fact to light very quickly. Soccer, football (USA), baseball, softball, track and field, field hockey, golf, surfing, racing (many variations),beach volleyball, swimming, waterskiing and other watersports, cycling, inline skating, skateboarding, lacrosse, snow skiing and snowboarding, tennis, badminton, cheerleading, rugby, equestrian, rodeo ... I can't cover lens recommendations for all of these sports in this page, but I will make some generalizations and recommend some of the best and most popular outdoor sports photography lenses. When shooting action sports, action-stopping shutter speeds are usually a top priority (1/500, 1/1000 or higher). A specific example: I usually use 1/1250 (or faster) for soccer photography. A wide aperture is usually the key to get these fast shutter speeds. Outdoor sports are often played in bright daylight conditions where even f/5.6 max aperture lenses will work fine, but fast/wide aperture lenses are still a big advantage. Wide apertures can blur the especially distracting sports venue backgrounds and can yield the fastest shutter speed/lowest ISO setting combinations. When cloud cover moves in or the sun is below the skyline, I seldom want a lens with a max aperture narrower than f/2.8. Even at f/2.8, very high ISO settings can sometimes be needed. And if you are shooting outdoors under the lights, you will probably think that f/2.8 is too narrow. Getting the right focal length is, as usual, very important for selecting a sports lens. Many outdoor sports participants cover a wide range of distances from the photographer's position. Professional sports photographers shooting big events will usually be using at least three camera setups simultaneously - to make sure that they have the right focal length available all the time. Probably two of those lenses will be zoom lenses. Zoom lenses are great for getting the framing right for each opportunity - and for delivering a wide range of views and perspectives. But, due to narrow aperture issues, The ultimate sports lenses with focal lengths over 200mm are prime/fixed focal length lenses - with wide apertures. If you are shooting large field sports (soccer, baseball, American football), you are probably going to want a full frame 400-600mm focal length angle of view. If you are shooting track and field, with full access to the venue, any focal length from 24mm through 400mm or even 600mm can be useful. If shooting from outside of the fence or from the bleachers, you are probably going to want 200mm - 400mm depending on your subject distance. Autofocus performance is a big differentiator between lenses when action sports are the subject. While most lenses can capture a distant subject running perpendicular from you across a field (a constant focus distance), it takes a good lens to be able to focus-track a fast-approaching or departing subject at close distances or with tight framing. Economy lenses will not typically be up to this challenge. Image stabilization, a feature on many of the lenses I recommend, is not a big advantage for many types of action sports photography. The required shutter speed for handholding sports lenses is not usually a concern as the shutter speed required to stop action is usually fast enough to stop camera shake. IS is, however, a very useful feature that you might use for alternate subjects at an event (people in the stands, players on the bench). Many IS lenses have a panning stabilization mode (Mode 2) available. You might find the panning mode helpful for certain action sports subjects - it is especially effective for capturing motorsports and other flat-track wheeled sports (cycling for example) with a motion-blurred background. I have not found Mode 2 helpful for human runners as there is frequently too much up and down to go along with the forward motion. Give it a try for your sport(s). I typically had IS turned off when shooting field sports (such as soccer) as IS and I battle for control of the subject framing. Then Canon introduced mode 3 IS. Mode 3 IS initiates the IS system with the shutter release half-press, but does not actually stabilize the image until the shutter is released. I find mode 3 to be helpful and now shoot sports action in this mode on the lenses availing it. I will start the sports lens recommendations list with the best of the best - and their prices reflect this. If you are shooting professionally - or you really care about the image quality of your sports photos, these are the lenses you need to be using, the investments you need to make. Buy or rent them. Note that lenses at this quality level have historically held their value very well. Use them as long as you want and then you will likely recoup a significant amount of your money back when you resell them (such as when the kids get out of school and/or no longer participate in sports). I actually made thousands on the resale of my IS version I super telephoto lenses (and sold them at very fair prices) due to the significant price increases during my ownership period. If I was responsible for capturing an amazing image at a sporting event and had to pick one lens to do this with, the 400 f/2.8L IS II would be my easy choice. This lens delivers phenomenal image quality including a very diffuse background blur, it has very fast and very accurate AF, it is weather sealed and it has impressive build quality. I can count on this lens to bring home the impressive shot every time (or, every time I do my job properly I should say). The 400mm focal length works on the big field (in many situations) and its reach can be increased with extenders. 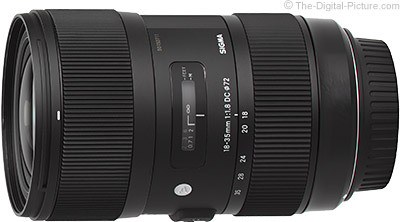 This is the longest f/2.8 focal length lens available - except for Sigma's enormous and incredibly-high-priced Sigma 200-500mm f/2.8 EX DG IF Power Zoom Lens. When I want more reach than the 400mm f/2.8L IS II gives me, when I am focusing on subjects/players farther from my vantage point than 400mm adequately reaches, this is my go-to lens. The 600mm focal length reaches deeper into the playing field, track, etc., keeps the photographer farther from any potential danger and has a larger subject framing distance sweet spot. The longest f/4 max aperture focal length available, 600mm will blur the background very nicely. The overall build quality and performance of this lens, including image quality and autofocus accuracy, is impressive. 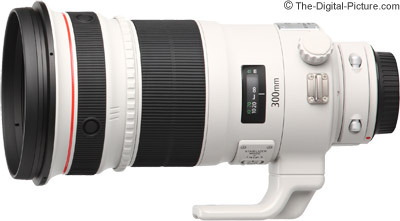 It is not as long in focal length as the 400mm f/2.8L IS II, but the 300mm f/2.8L IS II is at least a match in performance - and it is smaller, lighter and less expensive. And if 400mm is too long (especially possible for an APS-C body) for your need, this is THE lens to take. Or, add an extender - this lens performs exceptionally well with them. The f/2.8 aperture is as wide as it gets at 300mm, the image quality is as good as it gets at any focal length, the autofocus speed and accuracy rock. This lens is built for professional use (or perhaps I should say "abuse") including use in inclement weather. When you don't have control over the distance to your subject, the 200-400 L's zoom range will enable you to deliver far more quality-framed results than when using a prime lens. While this lens does not focus quite as fast as the big white prime lenses, it gives up very little in terms of image quality. It is not as long in focal length as the 600mm f/4L IS II, but the 500mm f/4L IS II is a match in performance - and it is smaller, lighter and less expensive. The longer focal length 600mm lens will create a stronger background blur at the same aperture with similar subject framing. If I were handholding the lens for any length of time? I would definitely go with the 500. This lens performs on par with the other super telephoto lenses I just recommended - impressively. APS-C format body owners are going to find this focal length a touch long for most sports photography uses. 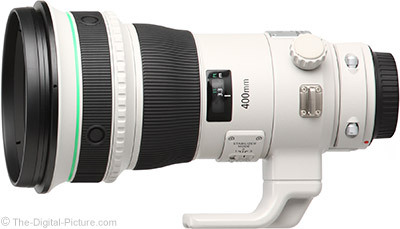 If the 400mm focal length works for you and an f/4 aperture is wide enough, the 400mm DO II is an amazing performer. The extreme light weight of this lens (relative to its focal length and aperture) allows easy handholding for most. APS-C format body owners are going to love this focal length when shooting on the big field. Having an f/2.8 max aperture lens with a 120-300mm focal length range mounted to your camera sets you up very nicely for a wide range of sports action in a wide range of lighting conditions. This is not the fastest-focusing lens, but AF speed is adequate for many sports uses. Build quality is really nice and this lens looks great as well. Optical image stabilization is there when you need it. 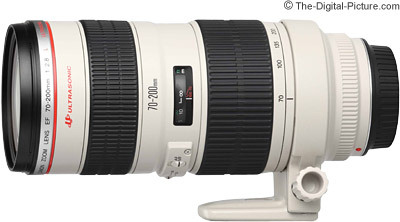 The 70-200 f/2.8L II IS Lens is an extremely impressive zoom lens - and it excels in sports photography. This is the lens to have for capturing sports action happening closer to you. If you watch a professional sporting event, you will typically see this lens mounted on a camera hanging over the shoulder of a photographer using one of the previously-mentioned super telephoto lenses on a monopod. He/she will grab the camera with this lens when the action comes closer to the sidelines. When action is happening closer to the photographer, the focal length needed for the desired subject framing changes more rapidly. This makes the zoom feature even more valuable. This is one of my most-used lenses - I would be lost without it. The 70-200mm focal length range works well for many sports needs and this lens' f/2.8 aperture works well in many venues. The image quality delivered by this lens is stellar and the autofocus performance insures that image quality is realized. 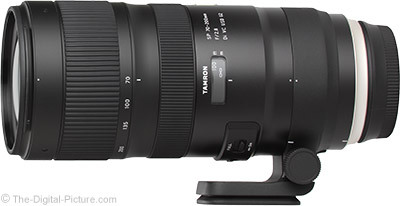 This lens looks great and its price is especially attractive. 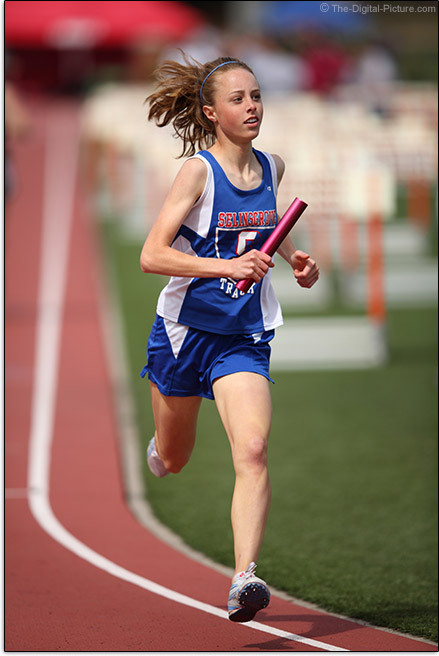 It is hard to argue with the 100-400mm focal length range for sports. 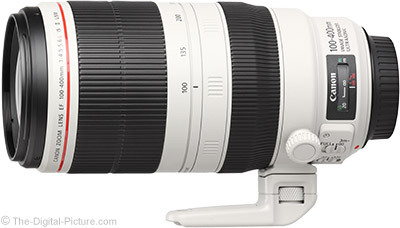 The 100-400L IS II is a complete redesign of the wildly-popular earlier version of this lens and holds many advantages including excellent image quality at all focal length and aperture settings. While this is not an inexpensive lens, it is far less expensive (and far smaller/lighter) than the f/2.8 super telephoto lens options. The f/5.6 max aperture becomes an issue when the light gets dim and this lens will not blur the background as strongly as the f/2.8 options. 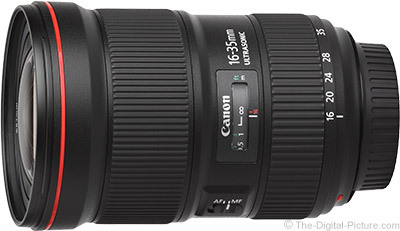 The Canon EF 16-35L III is another always-have-with-you sports lens. While the 35mm long end leaves a gap on the 70mm wide end of the 70-200mm, you may not find the gap worth carrying another lens to fill. This is a professional grade lens with excellent weather-sealed build quality, fast and accurate autofocus and incredible image quality even wide open at f/2.8. Since an athlete captured in the 16-35mm focal length range is going to need to be close to be recognizable, and since close can put the photographer in the way of the action, this lens is a great choice for a remote camera. The perspective delivered by this lens can be very desirable for a sports photo. This lens also shines for taking shots of the whole stadium or sports arena – giving a completely different perspective on the sporting event. This lens is also a great choice for the after-the-game interviews where a shoot-from-overhead and pray-that-you-get-something-good technique is needed. The 24-70mm f/2.8L II lens is the easy right choice if your sports photography needs fall into the 24-70mm focal length range. 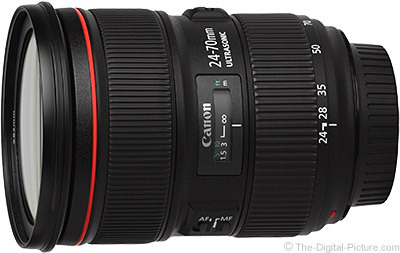 The 24-70L II is all about performance and this lens represents as-good-as-it-gets. The range of focal lengths on this APS-C-format-only zoom lens is not long, and the focal lengths available are wide, but having an f/1.8 aperture in a zoom sports lens is invaluable. If you can get close enough to the action to make 18-35mm properly frame your subject, this lens will stop low light action and create background blur like no other zoom lens can on an APS-C format camera. This lens has great image quality, great build quality and looks that are at least as good. 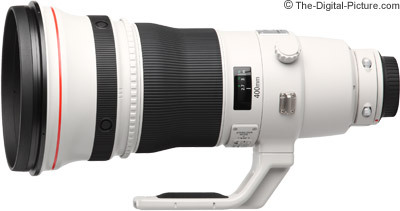 Sports photographers on a tight budget need to look no further than the Sigma 100-400 Contemporary lens. For a value price, this lens avails the long focal lengths so greatly needed for this purpose. The aperture isn't terribly wide and a tripod foot is not available, but great image quality is part of the package. The 400 f/5.6L gives you a long focal length in a thin, light lens with fast autofocus and great image quality. The f/5.6 max aperture becomes an issue when the light gets dim and this lens will not blur the background as strongly as the f/2.8 option. Adding image stabilization to this lens would greatly extend its versatility, but it is a very good choice for sports as-is. This relatively small/thin/light lens with a moderately long focal length performs very well in the sports arena. The f/4 aperture is not f/2.8, but it is better than f/5.6 - and the price of this lens is more attractive. Image stabilization, though an earlier implementation of such, extends the versatility of the 300 f/4 IS - and so does extender compatibility. 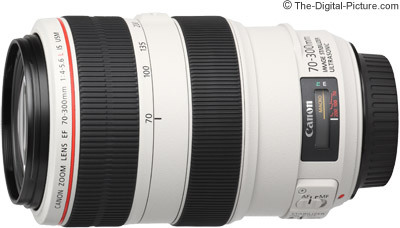 This lens will autofocus on all Canon EOS bodies when the 1.4x extender is mounted. 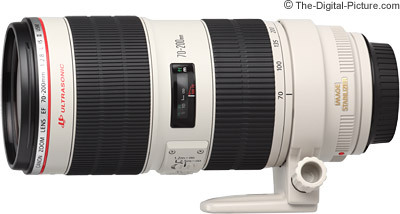 The 70-300L IS has a nice sports photography focal length range - especially for an APS-C body. Fast Ring-USM AF, weather sealing and pro-grade build quality are additional attractions for the sports photographer. If you can't afford the 70-200 f/2.8L IS II, the 70-200 f/2.8L is the next-best choice for a sports lens in this focal length range. This lens has very nice image quality and the f/2.8 gives you the brightness you need to capture action in low light. If you don't need the 70-200 f/2.8L IS II Lens' f/2.8 max aperture, the 70-200 f/4L IS II will give you everything else in a smaller, lighter and less expensive package. Without the f/2.8 aperture, you will need twice as much light to stop subject motion (at f/4) and you will not be able to create a background as diffusely blurred. But, you also give up a substantial amount of size (still fixed), weight and cost. You give up very little in image quality or other pro-grade features including solid, weather-sealed build quality, and you even gain a better IS system than what's found in the f/2.8L IS II model. If you can't afford any of the other telephoto sports lenses listed on this page, this is the lens for you. You should not expect to tightly frame subjects in the middle of a large field with a 200mm focal length, but this lens has fast and accurate autofocus along with very nice image quality. It is my entry-level sports lens recommendation. The list above is not an exhaustive list of lenses that can be used for outdoor sports photography, but these are my top picks. Any of the recommended Canon indoor sports lenses will work well for outdoor sports photography. 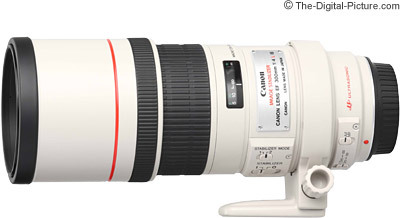 Also visit the Canon Lens Recommendations page for other recommendations.